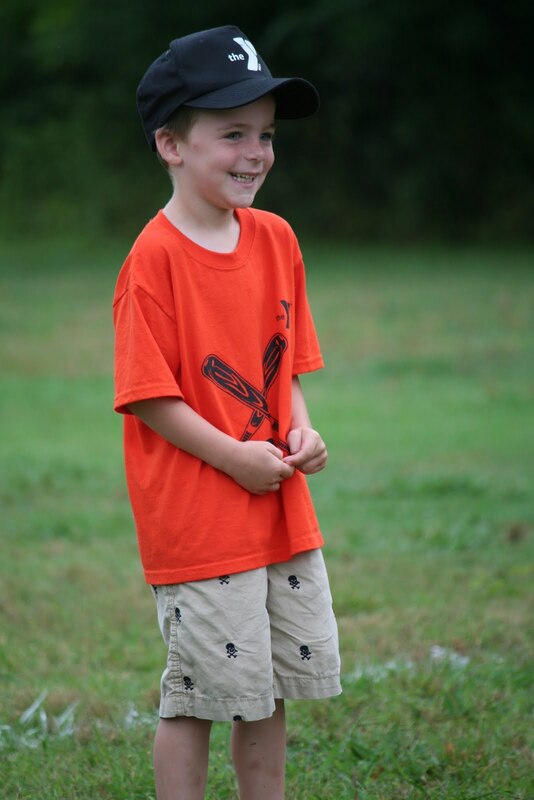 We’re already five weeks into it, but Jack is playing on his first sports team this summer. 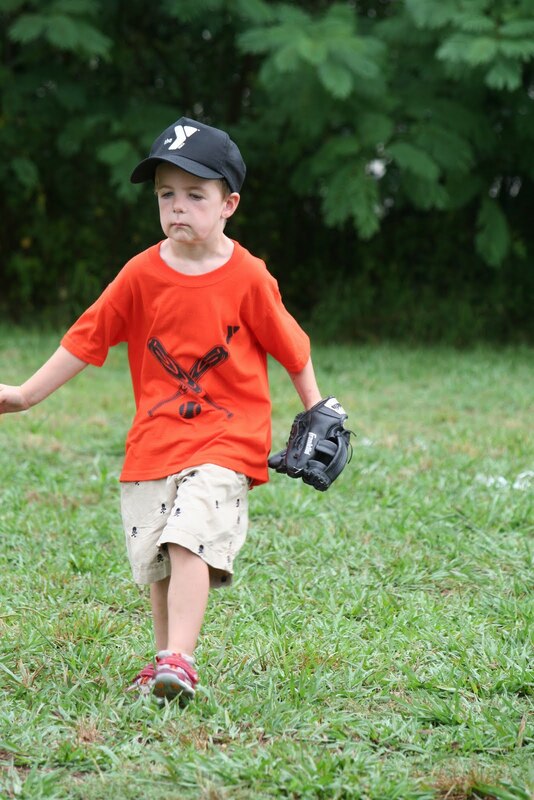 We signed him up for T-ball through the YMCA and he is loving it. He has practice one night a week and a game on Saturday morning. I completely forgot my camera on his first game, but I’ve since remembered to bring my camera along. 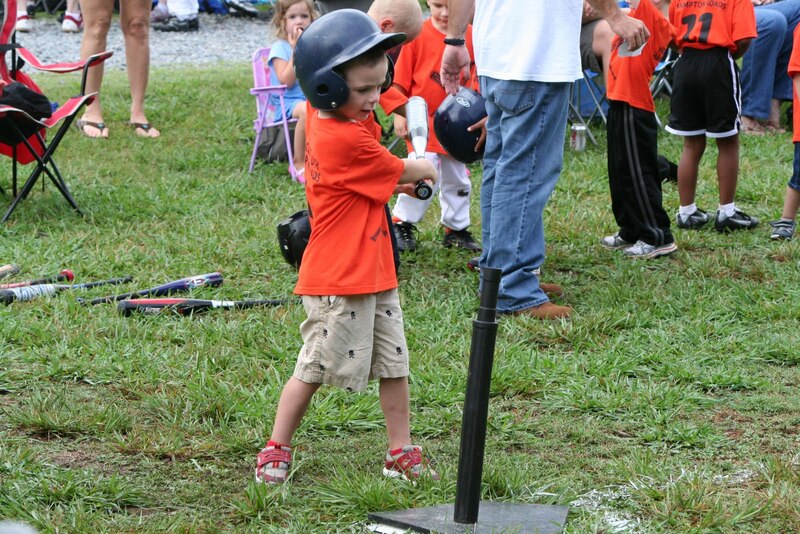 My first impression of 3 to 5 year old T-ball was that it didn’t seem very organized but Pat made fun of me and told me this was just what we wanted for Jack’s first experience. It was just a little bit like herding cats. I didn’t play any sports until 5th grade so there weren’t any kids throwing tantrums then because they didn’t want to bat. Jack has been very excited to play and he likes to practice every night in the backyard. 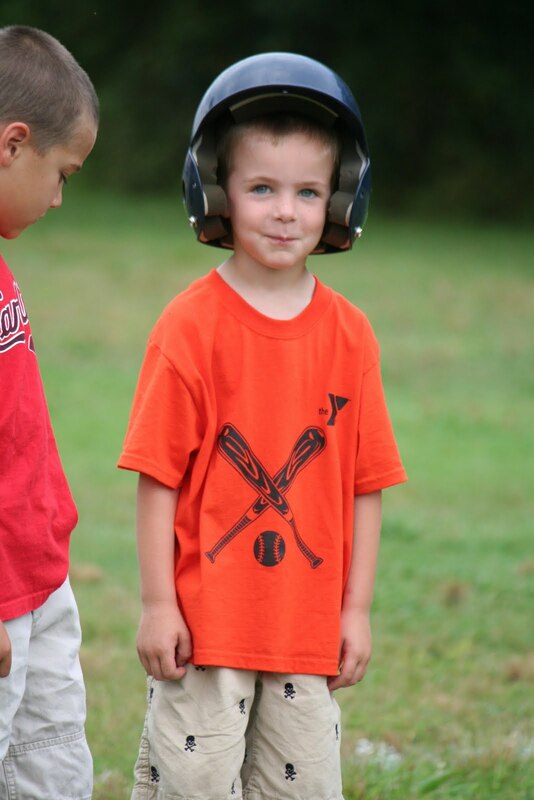 When he gets on the field during games, you can tell that he feels nervous. He is uncomfortable when he doesn’t know exactly what he is supposed to be doing. (It reminds me of when he first learned to talk – he didn’t want to say the word unless he was absolutely sure that he would say it correctly.) I imagine with a bunch of people yelling on any given play that it is a little confusing to figure out what to do. As the weeks go on, he is becoming more comfortable. 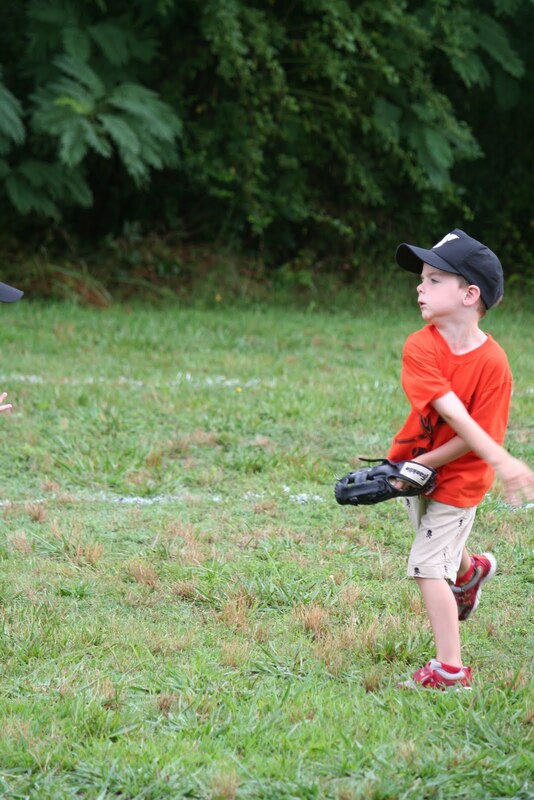 He has been playing first base and is starting to get the hang of what he needs to do every play. 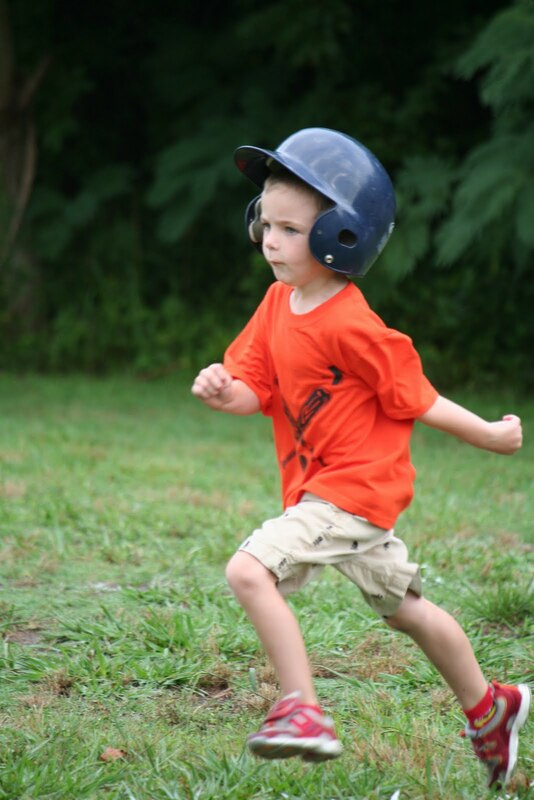 He’s also got his Dad’s intensity so he’s gives it 100% and I think he tries to hit a home run every time. You can see it in his face. The team has come a long way in just 4 games and 4 practices. I think they’ve realized that it is not rugby and there is no longer a scrum while everyone tries to get the ball after it is hit. They’ve figured out the batting order and how the innings work and to throw the ball to first after every hit. They’re learning to stand in line and shake hands at the end of the game. And they definitely know to look for a good snack after the game! 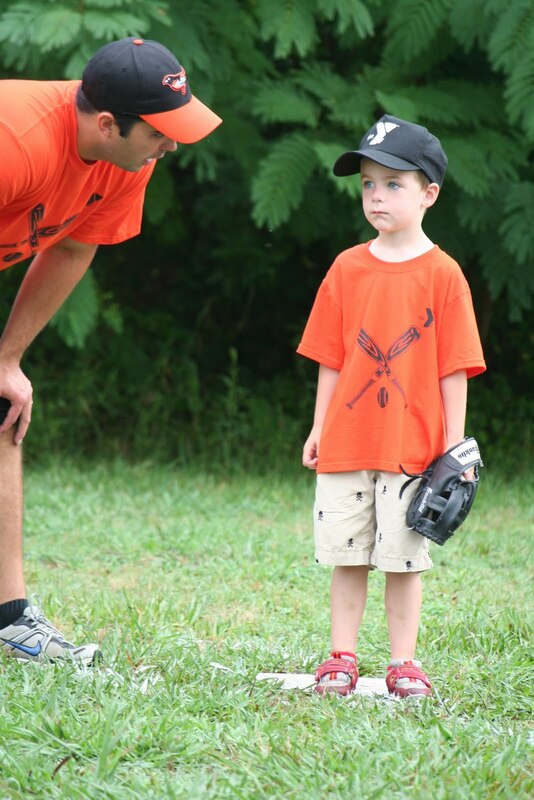 What is amazing to me is that the coach’s older son is just a couple years older than Jack and he’s pretty much got baseball figured out. He stands out there and plays catch with the kids and helps coach and it’s pretty amazing what a difference two years will make. This has been a great experience for Jack. Casey could have played too…I didn’t realize that 3 year olds could play, but for now she is Jack’s #1 cheerleader and she stays busy during the games by climbing all over Pat and I and moving her water bottle from cup holder to cup holder. I don’t know how I capture this but his face is weird…and hilarious!